READY TO SHIP in Sea Foam, Aqua, Coral and Seaside. 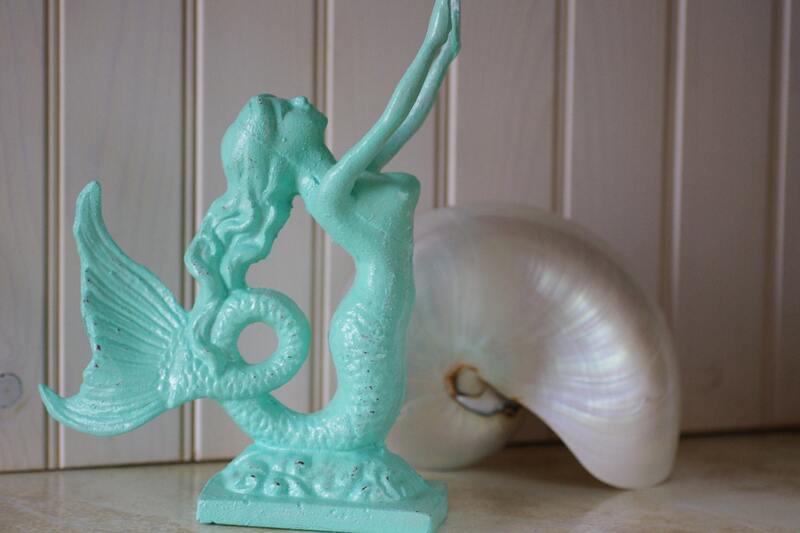 This beautiful mermaid would be perfect as a bookend or as a door stop. She would be the perfect gift for anyone who loves the beach or mermaids. We have refinished her by priming, then giving her a couple of hand coats of coral paint, lightly sanded and finally a protective sealant so she will stay lovely for years to come. We have added four small felt bumpers on the bottom to protect your floor or tabletop. Colors in photos are sea foam and coral. This listing is for ONE mermaid bookend/door stop.